Alll this week on Breakfast, we've been looking at the decline of specialist shops, as British high streets are increasingly overshadowed by huge supermarkets. We've taken a collection of local shopping centres and set them a socks-and-chops challenge. David Sillito has been visiting various parts of Britain, armed with a shopping list of essentials. 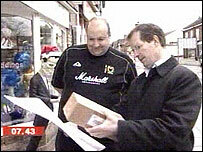 He trudged the nation's high streets, looking at the best and worst of what's on offer. Catch up here with our full week's coverage. You can have your say on this story, using the BBC's interactive message board by following the link on the right hand side of this page. Once a bustling market town, Fenny Stratford is now overshadowed by the shops of nearby Milton Keynes. David talks to shopkeepers on Watling Street - and finds the socks part of our shopping challenge particularly difficult. Fifty years after its creation, the new town of Harlow in Essex is looking pretty down at heel. How come it seems to have lost the plot? David Sillito takes one of its original architects back to see what's gone wrong. We all say we love old-style High Streets, with thriving independent shops such as butchers and bakers. But what happens when a supermarket giant arrives? David Sillito goes to Abergavenny in Monmouthshire to find out. Is the way we shop making us less tolerant of other people? Well, some say the decline of our high streets and the boom in private shopping centres is segregating the community between the 'haves' and 'have-nots'. Today David revealed the winning town, as voted for by users of the BBC News website. It's the town of Yarm in North Yorkshire, and David proved on-air that the town could pass our socks and chops challenge.